Support your patients’ efforts toward a healthier lifestyle. 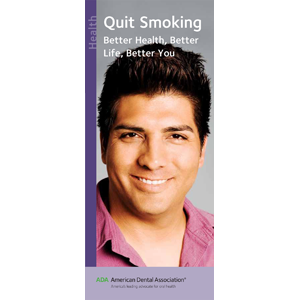 This brochure is geared toward smokers actively trying to quit, or just starting to think about it. Overall health risks of smoking are outlined as well as oral risks. Includes photos of smoker’s stains and tongue cancer. Patients are reminded of the benefits of quitting and given phone and web resources to help. An “Are you ready to quit?” questionnaire and “10 tips to stop smoking” help with goal setting. 6-panels. Minimum order 150. Click Add to Cart then personalize for free. Now you can add personalized information on the front, back, or both covers on all brochures.